Oak Bay Marina is conveniently located in beautiful Victoria, British Columbia, at the south end of Vancouver Island. Just ten minutes from downtown, and set in one of Victoria’s most attractive neighbourhoods, the Oak Bay Marina offers full moorage facilities in a picturesque setting. From downtown Victoria, follow Johnson Street east bound until it becomes Oak Bay Avenue. Keep right when you reach Newport Ave. Turn left on Currie Road at Windsor Park, and follow Currie one block to the ocean and the Oak Bay Marina. See you soon! 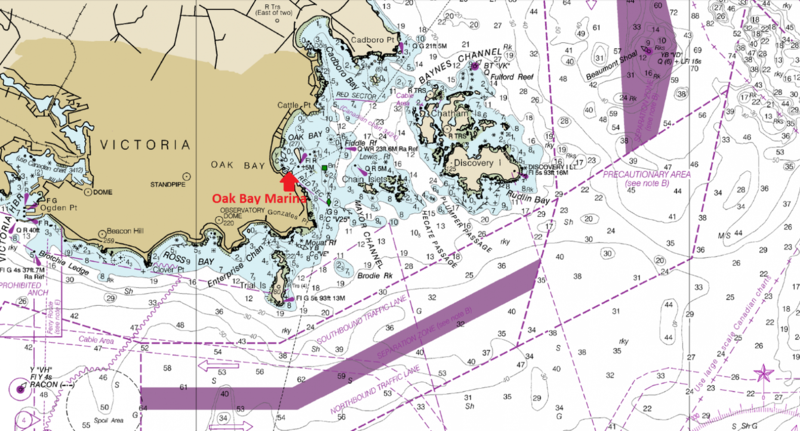 Directions: Oak Bay Marina is located at the Southern end of the Strait of Juan de Fuca, about 8 nautical miles East of the Victoria Inner Harbour. Easily accessible from both Haro Strait on the East coast of Vancouver Island and through Juan de Fuca Strait on the West coast. Oak Bay Marina is a division of the Oak Bay Marine Group.